Pinpointing the cause of pain in the back, or posterior, of your knee can be like solving a puzzle. Many different conditions can cause pain in this area, some much more common than others. While posterior knee pain can indicate something simple like a muscle strain, more serious issues like a blood clot or tumor might also be to blame. The origin and nature of the pain, and any accompanying symptoms, help narrow the list of possible causes. A physical exam, imaging studies and other tests aid in making a final diagnosis. Strains, or tears, in one of the muscles that cross behind the knee -- the hamstrings, gastrocnemius and popliteus -- can cause posterior pain. While anyone can injure these muscles, people who lack flexibility or fail to warm up properly before exercising are at a higher risk. Strains can occur suddenly or develop gradually over time, typically causing dull, achy pain. The hamstring muscle group in the back of the thigh is especially active during running and kicking sports. Hamstring strains usually present with pain in the back of the knee or thigh. 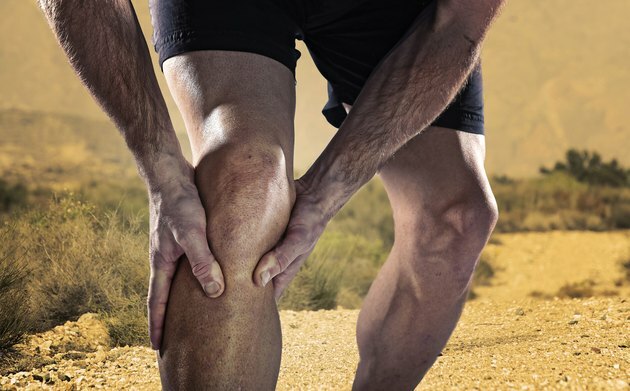 Activities such as bending the knee, kicking or running can worsen the pain. The calf muscle, or gastrocnemius, aids in propelling you forward while walking or running. A strain at the upper end of the gastrocnemius causes pain in the back of the knee that worsens with knee bending or rising to your tiptoes. The popliteus muscle helps stabilize the knee joint during movement. Injury to this muscle can be challenging to diagnose. In addition to posterior knee pain and tenderness, there might be pain while standing on a slightly bent knee or when swinging the leg forward while walking. A popliteal cyst, also known as a Baker cyst, occurs when excess joint fluid protrudes outward at the back of the knee joint. The condition most commonly develops gradually, due to arthritis or another disorder causing inflammation of the knee joint. Less frequently, a popliteal cyst arises quickly due to a knee cartilage, muscle or ligament injury. These cysts often produce a visible lump at the back of the knee, accompanied by achy pain. There may be pain or difficulty when bending or fully straightening the knee. Clicking, locking or buckling of the knee might also occur. Knee bursae are fluid-filled sacs that prevent friction between the moving parts of the joint. Repetitive activities -- such as biking, running or squatting -- can inflame one or more of the bursae in the back of the knee. Inflammation of these sacs, known as bursitis, typically develops gradually. The pain begins as a dull ache and builds as inflammation worsens. Pain intensifies with repetitive, provoking activities. The involved area is typically tender. The posterior cruciate ligament (PCL) and posterolateral corner structures of the knee provide stability to the joint. Injuries to these ligamentous structures can result in posterior knee pain and usually occur due to a sudden, traumatic incident. The PCL is typically injured when a rear-directed force is applied to the front of knee -- such as a forward fall onto the knee or hitting the knee on the dashboard during a car accident. Swelling and giving way of the knee can occur with more severe sprains of the PCL, but this is not always the case. Many people with mild to moderate PCL injuries are able to walk, though the knee joint may feel stiff and unstable. The posterolateral corner structures of the knee include muscles, ligaments and other structures that give stability to the outer portion of the back of the knee. These structures are most commonly injured with excessive twisting on a planted leg, or when a blow is applied to the front of the knee. Depending on the severity of the injury, significant instability in the knee can result, making walking difficult. The PCL and posterolateral corner of the knee are frequently injured simultaneously. Deep vein thrombosis (DVT) refers to the spontaneous formation of a blood clot within a deep vein. DVT most commonly affects the deep veins of calf, knee and thigh. Formation of a clot can lead to tenderness in the calf or behind the knee and may be accompanied by redness, swelling and warmth in the area. DVT risk factors include smoking, recent trauma or surgery, prolonged immobilization or bed rest, and use of female hormonal therapy or contraception. A DVT can lead to potentially life-threatening complications and requires urgent medical treatment. A less common condition, called popliteal artery entrapment syndrome, can cause posterior knee pain along with numbness and tingling in the lower leg and foot. The condition develops due to compression of the popliteal artery, which passes behind the knee and provides oxygen-rich blood to the lower leg. Color changes or coolness of the foot and toes often occur with popliteal artery entrapment. Weakness of the popliteal artery wall can cause it to balloon, a condition known as a popliteal aneurysm. This condition often causes no symptoms unless a clot forms in the aneurysm or it ruptures. Among those who experience signs and symptoms, possibilities include posterior knee pain, swelling in the lower leg and foot, and nonhealing ulcers on the foot. Popliteal aneurysm rupture is very rare but potentially life-threatening, requiring emergency medical attention. Posterior knee pain may rarely be caused by other conditions, such as a tumor, sciatica or other nerve problems. Cancerous and noncancerous tumors arising from bone or other tissues in the knee can potentially lead to posterior knee pain. Pain due to knee tumors often begins as a dull ache that might progress in severity over time. Cancerous tumors may be accompanied by night sweats, fevers or unintentional weight loss. The sciatic nerves arise from each side of the lower spine and supply muscle and sensory innervation to each leg. Sciatica describes compression of the sciatic nerve that triggers pain in the buttock, back of the thigh and posterior knee. It usually occurs on only one side and is worst while sitting. It may also be accompanied by numbness and tingling in the same areas. In some cases, problems in the hips can cause referred pain to the posterior knee due to shared sensory nerves. Nerve damage in the legs -- due to diabetes, toxic substances or other conditions -- might also cause pain, numbness or tingling in this area, although it is rarely limited to just the posterior knee. Any new, unexplained or worsening pain in the back of the knee should be treated seriously and reported to your doctor immediately. This is especially important if the pain is the result of a traumatic injury, you experience difficulty walking, or if it presents with risk factors or signs or symptoms of a DVT or tumor. Seek emergency medical attention if you experience posterior knee pain accompanied by: -- Shortness of breath. -- Fast, pounding or irregular heartbeat. -- Dizziness, lightheadedness or fainting. -- Sudden cough, or coughing up blood. Vascular Surgery; Linda Hands et al.